Free WordPress classifieds themes make it simple and easy to present content to visitors with precision. You can improve the user experience of your site quickly by incorporating one of these options during your installation or website upgrade. Make sure that you choose the free theme install with these choices as the premium content can be priced at $59 or more. This option provides you with an opportunity to create an entire classifieds directory site where visitors can place or view advertisements at leisure. You can install this portal in just minutes while still managing your own posting needs with your site. You have monetization options available, can change the colors to match your brand image, and customize the coding to make it appear and work in whatever way you prefer. This free WordPress classifieds theme offers a modern listing option that will provide you with a responsive setup that can complement your SEO efforts. 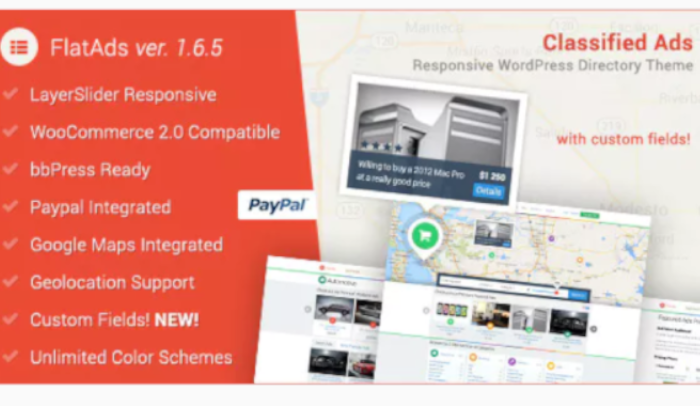 The theme integrates well with WooCommerce, and it also supports WP Job Manager, allowing you to sell commodities or offer job listings to your visitors. There is an option that integrates it with Google Maps to provide location details if desired as well. This option works with GeoLocation and Google Maps to help your site quickly organize the classified listings that your followers may wish to offer. It works in a manner that is similar to other directory listing sites, but it also supports custom fields so that you can develop your own categories or menu options. It is even possible to begin a classifieds forum on your site when choosing this option and the bbPress plugin. It is compatible with WooCommerce, optimized for SEO already, and it can facilitate transactions. 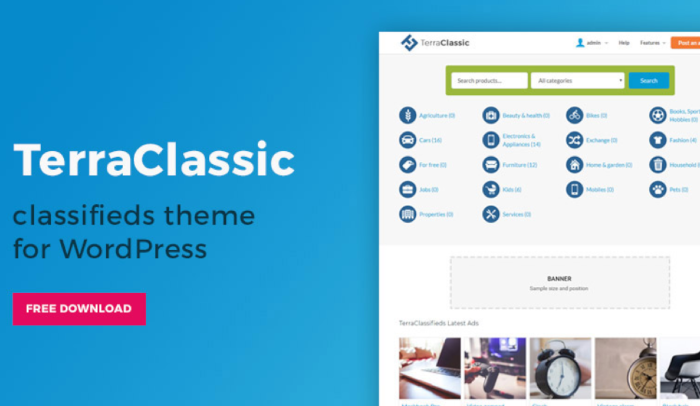 This free WordPress classifieds theme works with a plugin from the same creator that offers a simple point-and-click option that allows you to create ads quickly. The listings are user-friendly, simple, and clean, allowing for the addition of advertising from the front-end. Customers are required to be logged in to create a new listing, which reduces the amount of spam that you experience on your site. Customers can even check on their listings to determine its status, edit the content, or renew it if the item reaches its expiration date. 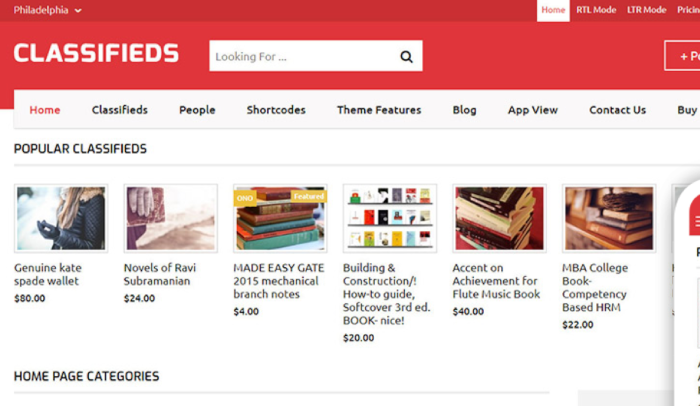 If you plan to use a WordPress classifieds theme for non-commercial purposes, then you will want to consider this option. It offers a custom menu feature, post types that you design, and taxonomies that you create. Custom page templates come with the theme, as does a widgetized sidebar, and there is room for two customs widgets on your page. The final layout is simple, yet effective in its design by placing color-coded options with listings for easy visual sorting. 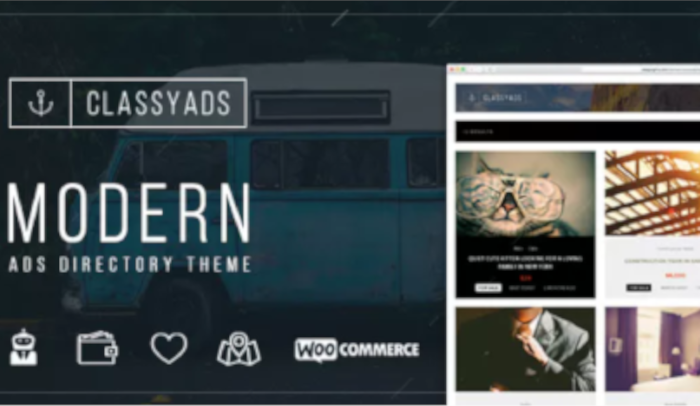 This theme will turn your website into something that resembles what you would find on Angie’s List or the first version of Craigslist. 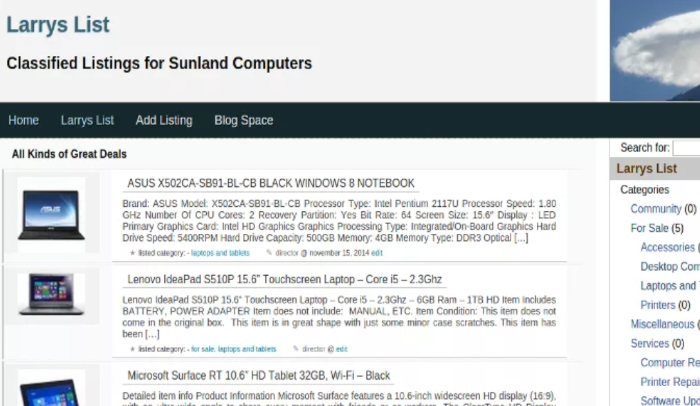 It offers a significant feed where the most recent listings appear near the top of the screen. The design of this option is far from complex, yet it still offers users fast access to the specific products that they might want. You can also create submenu options for specific product items that count how many listings are present in a way that is similar to what you would see with a blog archive sidebar. You can include a custom background with this theme. Social media and email links are also included. This free WordPress classifieds theme provides the visitor with the look and feel of a job board. The design is modern and flat, providing a simple user experience that does not create confusion. 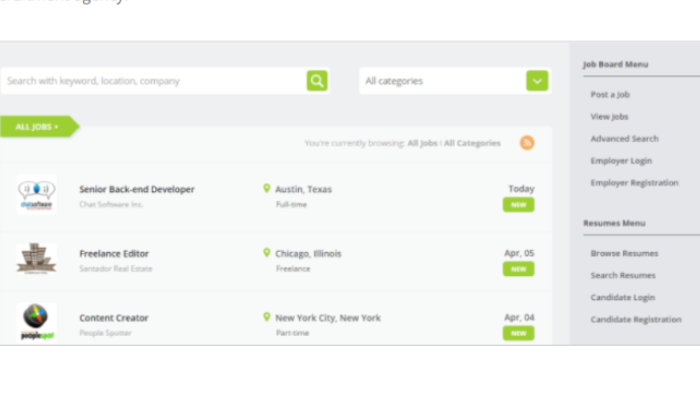 You will receive a full-width map template with this option to let others see where jobs are hiring, making it easier to connect employers and workers. Listings can also include specific items that may be for sale with a few tweaks to the layout. Custom dashboards are available to manage the information being uploaded to your site through this theme as well. 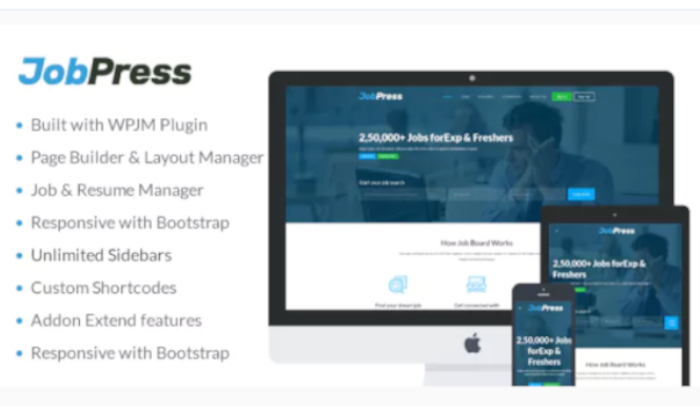 You will discover that even the highest-rated free WordPress classifieds themes may not meet every need that you may have. That is why it is critical to review all of the details of each product before downloading it for your site. Take it on a test run to see if it is useful for your needs. Then avoid the freemium costs or pro upgrades to ensure you have the perfect low-cost solution for your directory.